Mickey Mouse and a cast of beloved Disney characters will embark on a series of musical adventures through the magical powers of a sorcerer’s map in “Mickey and the Magical Map,” the all-new live show coming to the Fantasyland Theatre in Disneyland Park May 25. “Mickey and the Magical Map,” which can be experienced only at Disneyland, where the magic began, opens just in time for the family travel season. The Memorial Day weekend launches a Monstrous Summer of fun at the Disneyland Resort, which also features Disney Princesses at the new Fantasy Faire in Disneyland, and the spectacular new Cars Land and Buena Vista Street in the newly expanded Disney California Adventure Park. Performed in the most magical of lands, Fantasyland, the new show reveals a mischievous Mickey Mouse . The exciting show also complements the extensive variety of theatrical and live entertainment found at Disneyland Resort, including these: “World of Color,” “Aladdin – A Musical Spectacular,” the Mariachi Divas and “Disney Junior – Live on Stage!” at Disney California Adventure, and “Fantasmic!,” “Mickey’s Soundsational Parade,” the Laughing Stock Company at Golden Horseshoe Saloon, the Dapper Dans and Disneyland Band on Main Street, U.S.A., and the nightly summer fireworks show “Magical” at Disneyland. Guests also enjoy nightly dancing to live bands at Tomorrowland Terrace at Disneyland and the “Mad T Party” on the Hollywood Backlot at Disney California Adventure, which also features live street performances with Five & Dime and the Red Car News Boys at Carthay Circle on Buena Vista Street, the “Pixar Play Parade,” “Phineas and Ferb’s Rockin’ Rollin’ Dance Party” at Paradise Pier, “DJ’s Dance ‘n Drive at Cars Land” – and more! 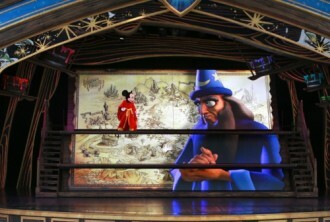 “Mickey and the Magical Map” has writing by Carolyn Gardner and is directed by Tracy Halas . The production designer is Steve Bass ; the creative director is Sylvia Hase ; the music is produced by Bruce Healey , supervised and arranged by Timothy Williams and supervised by Matt Walker . The show producer is Ray Coble .